Despite the cache of stories and themes built into the long-running Star Trek franchise, I entered the theater today with a cautious optimism. I readily admit my geekiness. I watched many of the Star Trek episodes from the numerous television series, along with most of the films. The franchise is at heart a sequence of morality plays melded with action and adventure. This narrative quality, which I won't go into here, was cataloged brilliantly by the A.V. Club label of The Onion. Knowing that many of the recent remake/rework/reboot films of pop-culture nostalgia have been groan-worthy, though sometimes briefly inspiring, (Specifically: the first two Star Wars prequels, Transformers, and Lost In Space.) I knew could not expect too much. And yet, Star Trek did not disappoint. The film combines high-quality digital effects with solid writing. It's both an exhilarating action film with well choreographed fight sequences, and a witty, intelligent character-driven story. The battles take more influence from Hitchcock and less Zack Snyder and other neo-gore directors. There is no needless bullet-time or exorbitant brutality. As for the writing and direction... J.J. Abrams allows his actors to live these classic characters as realistic people, wrought with emotion and complexity. 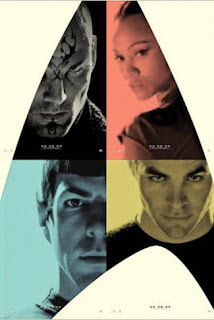 His Star Trek is homage mixed with a complete reworking of the original concept. The film maintains the universe created by Gene Roddenberry in 1966, but does not require the intimate knowledge of a "trekkie" to enjoy. And at its best it does not fail in its effort to remain accessible by avoiding the overwriting and redesigning of those other films I mentioned parenthetically. In a "classic" Abrams turn, time and its function are central aspects of the narrative. Through his work on LOST, Abrams has successfully manipulated time and space to enhance the story, and he does the same here. Time travel, black holes and planetary destruction all give the audience something to ponder, but without a specifically scientific emphasis that could hinder gross comprehension. And by this I do not mean that the film dumbs down the franchise, it merely draws the curtains wider to let more viewers see inside. By altering the beginnings of the Star Trek original series story, his film lends new dimensions to old characters, making Kirk angry and brash, but talented. Spock remains logical, but with a heart-on-his-sleeve quality. And Simon Pegg's short turn as Scotty is hilarious without being campy or tacked on. Despite the reboot, the film tosses in quotes that even a casual fan will pick up as allusive to the old series. Even Leonard Nimoy is aboard, evidently enjoying the film, and acting up a storm. And while many of these are the lighter, comic-relief points in the film, they do not detract from the drama and tension built through excellent acting, casting and characterization. While the film does lack much of the morality play design of those in Star Trek's past, by the end (which seems to come all too quickly) that does not matter. I felt attached to these new versions of those characters, each one breathed full of new life by a great story. Star Trek made me wonder what could come from George Lucas handing over the director chair to new blood, new writers and new cast members, rather than relying on an old formula infused with more needless information and childish design than modern audiences desire. Specifically, to the Star Trek's credit (and that of Abrams and the writers) we are not presented with long-winded explanations of Kirk's childhood, or forced to sit through the range of emotional changes in a young man without a father. Abrams and the writers know that jumping ahead from Kirk's brief appearance as a child, to his entrance into Star Fleet Academy early in the film is more enthralling than lingering to show the details of a broken home. They know the audience is smart enough to infer and imagine these missing bits. In short: less is more. So complexities of personality are implied, without the needless exposition that haunted those other prequels and remakes. Star Trek is more than worth the price of admission, and should be seen in the theater on the glory of the big screen where you can easily immerse yourself in the plot and its created world. If we are fortunate enough to receive more summer films of this quality throughout 2009, then it will have been a very good year.